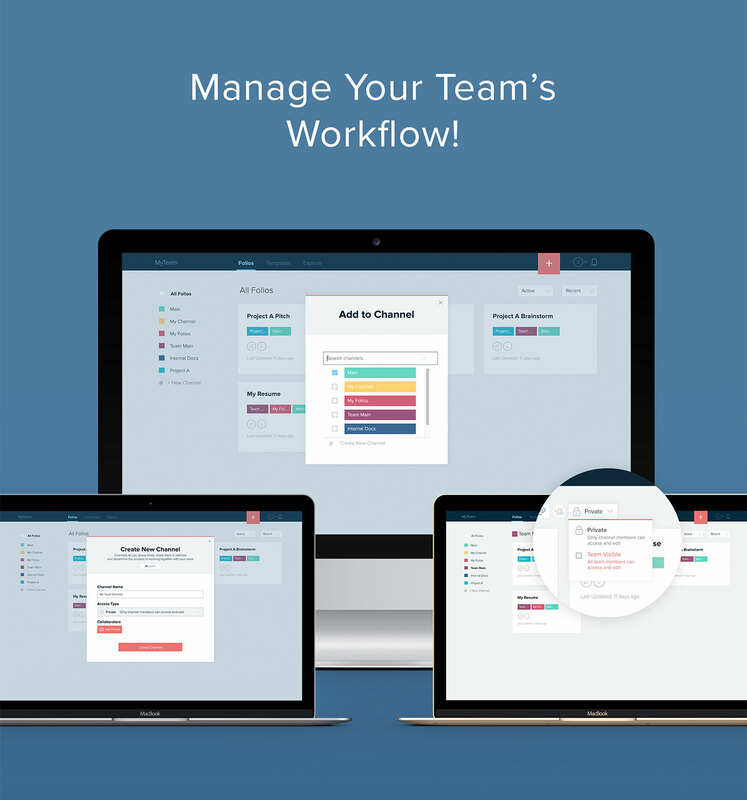 create, manage, present and share beautiful living documents. By clicking “Get Started – Free” I agree to Xtensio’s Terms of Service. Create anything you need – pitches, sales sheets, reports, case studies, agendas…Add images, videos, tables and other interactive modules. Drag and drop, resize, change backgrounds, colors. It’s the easiest editor ever. Find inspiration from our toolboxes, templates, how-to guides and examples. Or start from scratch and build your strategy and communications toolbox. The possibilities are endless. Changes automatically save and sync across all devices, in real-time. View collaborator activity and full revision history. Use channels to collaborate on groups of collateral. Add notes to versions, revert if someone makes a mistake. Share with a link, keep everyone always up-to-date. Work under a customized dashboard, branded with your company logo and your custom URL. Set your team’s style guide and keep all team folios (projects) effortlessly ‘on brand.’ Pick colors from your website. Add custom fonts. Update the style guide as you work with different clients and target new leads. Group documents by category – project, client, asset type, etc. Tag folios in multiple channels, keep your presentations organized however you need. Control access levels. Work with colleagues, clients and leads on collaboration channels. Track team activity with in-app notifications and engagement with folio stats. Copy and merge folios, reuse elements from different projects. Save your own templates. You can even embed on your website. Forget the output and focus on your work. Folios are responsive, live web pages, full-screen digital presentations and exportable PDF/PNGs all-in-one. All plans include 128 bit SSL encryption and backups. Add, remove users at any time, all collateral remains inside the team. All your folios are private. Add password protection to shared links or turn link sharing on/off. Your content is completely under your control. Find inspiration from our toolboxes, templates, how to guides and examples. Or start from scratch and build your strategy and communications toolbox. The possibilities are endless. Control access levels. Work with colleagues and clients on collaboration channels. Track team activity with in-app notifications and engagement with folio stats. All plans include 128 bit SSL encryption and backups. Add, remove users at any time. All collateral remains inside the team. All your folios are private. Join the 437,844 changemakers that have already made the switch. We use Xtensio both internally and on client projects. Creating buyer personas and beautiful client-facing documents has never been easier. Definitely better than your standard agency deck or PPT presentation. Xtensio provides some great templates to bring together all the elements I need to successfully develop my marketing campaign briefs.